In addition to displaying contours on the map, you can use this feature to combine the display of contours with amplitude extraction. The following shows an example of a workflow to display contours based on a velocity volume at the time slice of 3,000 ms. In the Map View, select "Horizon=3000" in the navigation bar. Click on the spanner icon beside Property. The Horizon Settings window will appear. 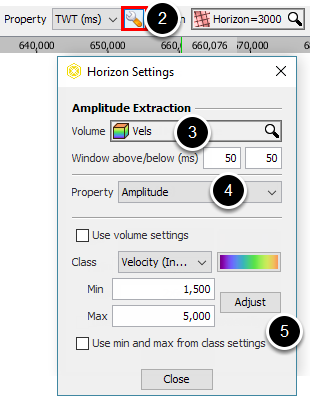 In the Details Panel of the 'Horizon=3000' horizon, select the velocity volume at Volume. The contours will be generated from the selected velocity volume. Note: To show amplitudes from a different volume, select another volume at Volume. Clear the Use min and max from class settings check box and then click Adjust to adjust the minimum and maximum clip of the class settings. This will make the best use of the colour bar in displaying the horizon. At the navigation bar in the Map View, select 'Horizon=3000' at Horizon. Expand the left panel and open the Display tab. 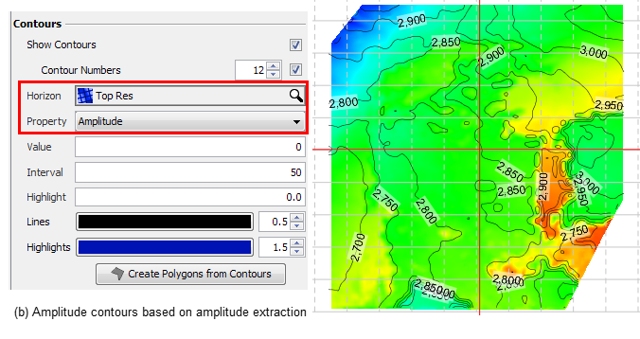 In the Contours section, select the Show Contours check box to display the contours on the map. 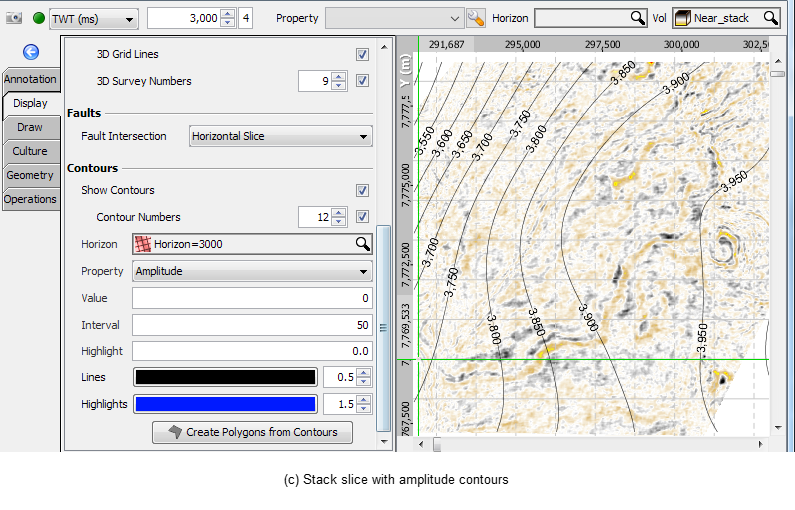 Select the Contour Numbers check box to display the contour values on the map. Type the font size for the contour values. 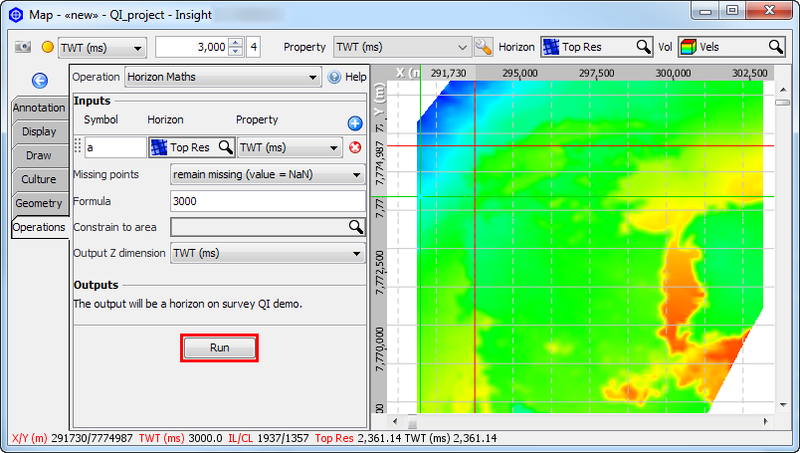 a) Display time contours for a TWT horizon by selecting the TWT property for the "Top Res" horizon. Note: If a velocity model has been specified for the Time-Depth parameters (see Converting Time-Depth), depth contours could be displayed instead. 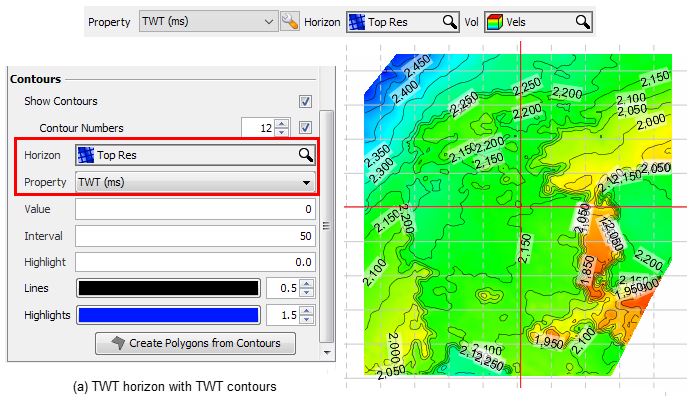 b) Display contours for extracted amplitudes on a TWT horizon by selecting the Amplitude property for the "Top Res" horizon. c) Display contours for extracted amplitudes at a constant time from one volume, while showing the corresponding slice from a stack by using this workflow. Prev: Views in Insight are zoomed all the way out, even when I click "Zoom to fit". Why is this happening? Next: How do I display a horizon with its contours in 3D View?